Because the physical problem is discretized only in the meridional plane and azimuthal effects are analytically integrated, the code is very efficient for studying axisymmetric fluid flow in the presence of large free surface deformations. Additional configurations required by customers can be added upon request. 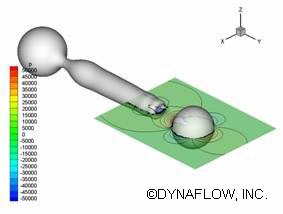 Dynaflow, Inc.® can also customize the program through mutual arrangement. 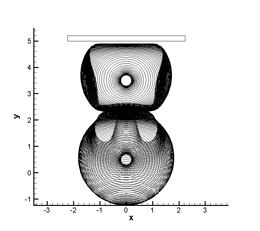 Two interacting bubbles near a fixed plate. For more information, please Request More Information.